The results could not be worse. By now you’ve heard that last night, a MASSIVE “Blue Tsunami” hit Minnesota and the races quickly began to fall. Tim Walz beat out Jeff Johnson in his race for the Governor’s mansion, installing another anti-gun militant as Minnesota Governor for the next four years. Shockingly, radical, America-hating Keith Ellison beat GOP candidate Doug Wardlow in the race for Attorney General. 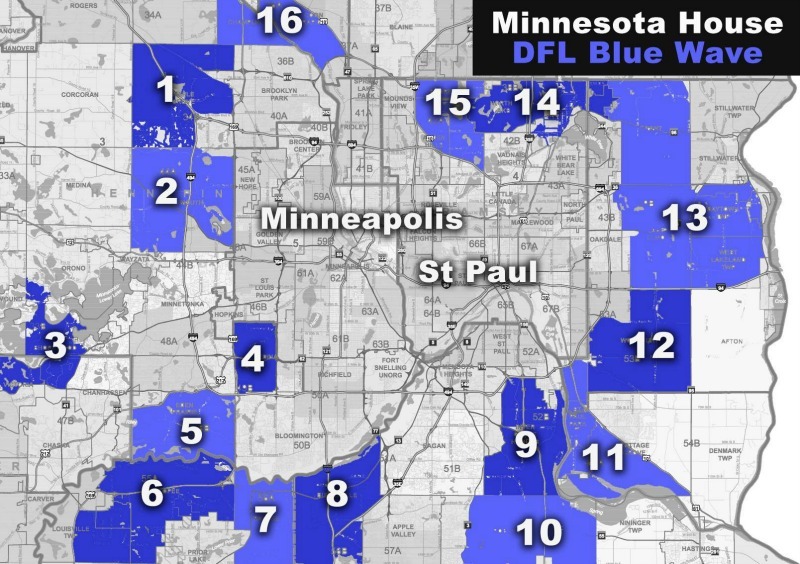 And the Democrats flipped at least SIXTEEN GOP seats in the Minnesota House, seizing a massive majority over the House Republicans and removing them from power. I’m very sorry to say that fantastic, pro-gun candidate Erik Mortensen (HD55A) was one of the sixteen seats and lost his bid for state House against anti-gun extremist Brad Tabke. And with only a 1-vote Republican majority in the Senate, and several GOP Senators already backing Bloomberg’s gun-control bills, to say that we’re in the fight of our lives to stop gun control in 2019 would be a complete understatement. The gun-control list goes on and on. You see, when radical anti-gunners seize this much political power, they don’t beat around the bush. When Republicans held the legislative majorities, they refused to pass any pro-gun bills, fearing that if they rocked the boat too much, they might lose their seats. Last night… they lost their seats anyway. Radical, metro Democrats will not make the same mistake. They know their best chance of ramming gun control into law with their new positions of power needs to be seized IMMEDIATELY, and that’s exactly what they intend to do when session kicks off in January. Site, we must stop them. We don’t have any other choice. The board of directors of Minnesota Gun Rights, our Director and myself are already planning a MASSIVE defensive program designed to keep these anti-gun radicals at bay and to STOP this gun control push in 2019. It’s going to be the largest defensive fight that Minnesota has ever faced. And coming out of the elections season, having gone BIG into targeted districts all across Minnesota, I have to tell you, our coffers are nearly empty. The 2019 legislation session is rapidly approaching and I shudder to think what’s coming with it – a tidal wave of gun control the likes of which we’ve never seen. Please make an immediate, EMERGENCY contribution to Minnesota Gun Rights to help us plan and prepare to fight this gun control onslaught. If you can do $25, $50, $100, $500 or even $1000, please click here now! The fact is, we only have two choices: we can sit down, give up and surrender our gun rights to these Leftists, or we can stand up, dig our heels in and FIGHT! Minnesota Gun Rights is going to FIGHT. Please help us do battle on behalf of your gun rights by making an IMMEDIATE contribution of whatever amount you can afford. I’ll keep you informed as we develop and roll out our defensive programs in the coming weeks before the 2019 legislative session but until then, gear up, we’ve a massive fight on our hands! P.S. A “Blue Tsunami” slammed into Minnesota last night, installing Tim Walz as Governor, Keith Ellison as Attorney General and gutting the Republican House majority by flipping at least 16 GOP House seats. Radical, Second Amendment stripping legislation is at the TOP of the list for our new, Democrat controlled government and I need your help NOW. This will be the biggest attack on the Second Amendment that Minnesota has ever faced. After emptying the bank account to run our programs during the midterms, we need an IMMEDIATE influx of funds to help us prepare for the 2019 legislative session that is coming up soon! Please consider an EMERGENCY contribution of $25, $50, $100, $500, $1000 or anywhere in between to help us FIGHT! Happy Thanksgiving from Minnesota Gun Rights!